Sterling silver pendant hand crafted in Krakow, Poland. 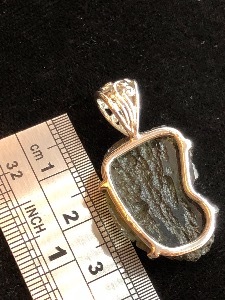 Moldavite is an olive-green or dull greenish vitreous substance known as a Tektite. The word Tektite comes from the Greek word tektos meaning "molten” they are natural glass rocks up to a few centimetres in size. Tektites are can be black-brown, olive-green (Moldavite) or white-yellow ( Libyan Glass ) and their shape varies from rounded to irregular. 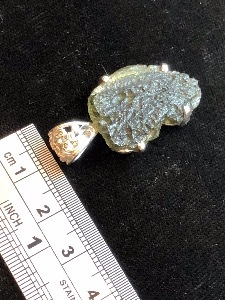 Scientists differ in theories regarding Moldavite's origin, nearly all agree its formation coincides with the crash of a large meteorite approximately 14.8 million years ago. Moldavite formed where Earthly and extraterrestrial energies have been bonded together, producing energies which can be felt by a increase of body temperature or even an emotional release from laughter to tears. 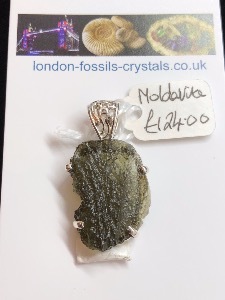 Moldavite is well known as a crystal with an ability of accelerating one’s personal spiritual path, when used for meditation assisting the ability to understand messages sent from higher realms, (ensure you have a grounding stone during meditation). Also it is said to be good for counteracting cynicism, It eases away doubts, even if the originator is unknown, and is said to calm worries about money by providing possible solutions. Compassion, Connectivity, a spiritual talisman and amulet of good fortune, fertility. Some may experience light-headedness or a lack of grounding and may need to acclimate themselves gradually to wearing it.